As it turns out...those two work together remarkably well. Just say'n. We have a brand new sketch for you this week over at Skipping Stones Design! AND...we also have a brand new sketch artist and two awesome guest designers!!! It's pretty much going to rock over there this month. For reals. Here is my first card for the month! I used the Home of the Brave set which just so happens to be on sale AND just so happens to be PERFECT for the upcoming Independence Day holiday! YAY! 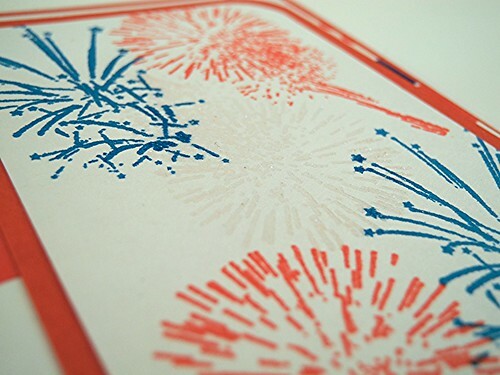 I stamped the fireworks in the traditional red and blue and then stamped the one in the center with VersaMark and heat embossed it with sparkle embossing enamel from Stampendous! I love the way it glitters in real life! Next time you are creating a flag to represent our country for ever and ever amen, please consult me in regards to color. They are TRICKY colors. I'm just say'n. That's all. Does that make me a horrible person? HAHAHA! How about you? Do you find red, white, and blue to be tricky? Or are you Canadian and just dealing with a flag that looks like it could be a Valentine only with a leaf instead of a heart? I think that sounds like MUCH more fun! YAY! No, but really...I don't think I'd be able to choose different colors because they always look good ON the flag...just not on my cards. Oh, well. *sigh* LOL! Okay...before I make the whole world mad by having a little fun with flag colors...I'm going to suggest you head on over to Skipping Stones Design and check out the brand new sketch! You don't even have to use SSD stamps to play along AND...one random winner gets a FREE set of stamps! TOTALLY FABULOUS!!!! YAY! Have a happy Tuesday and please remember to vote for my card in the Paper Crafts Gallery Idol contest! The widget is in the top right corner of my blog! You have to register to vote, but it's easy peasy! Thank you SO MUCH!!!! super cute- heading over to go vote for you!!!!!!!! GREAT card!! I love what you've done with the stamps!! great card Jingle!!! Loving these stamps!!!! Tricky colors or not, it turned out fabulous! 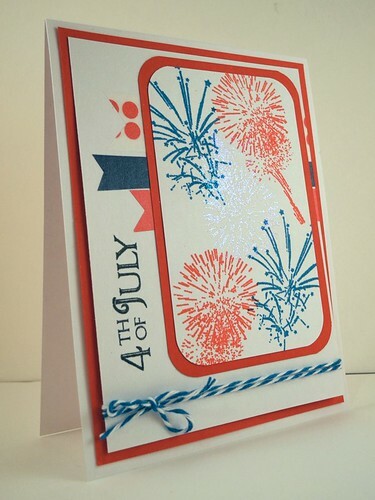 I really love the embossed white firework - awesome! this turned out BEAUTIFULLY! LOVE it! Seriously LOVE!!! That is all. Great card!! Looks like you pulled off the RW&B just fine!